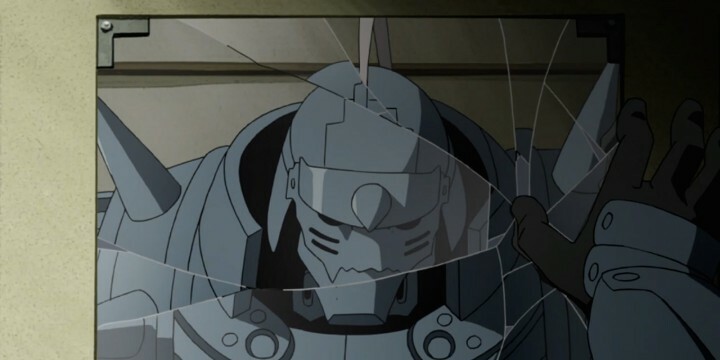 That bit of confusion aside, this is the first half of my complete review of Fullmetal Alchemist: Brotherhood and it covers episodes 1-33 and avoids all major spoilers for those new to this classic anime. Quite frankly, this is one of the best anime of the twenty-first century, as evidenced by the fact that even the most jaded, hipster anime fan remembers this series fondly, with many considering it their personal favorite, even six years after its release and after the industry has undergone many significant evolutions. While the rest of the industry seems to have moved to the 24-episode standard, this 64-episode show defies any modern sensibilities. 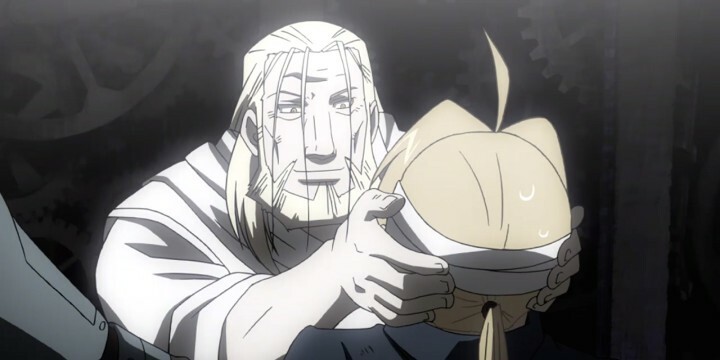 Fullmetal Alchemist: Brotherhood is just as famous for its contrasting humor as it is for its dark themes that made it such a seminal show. 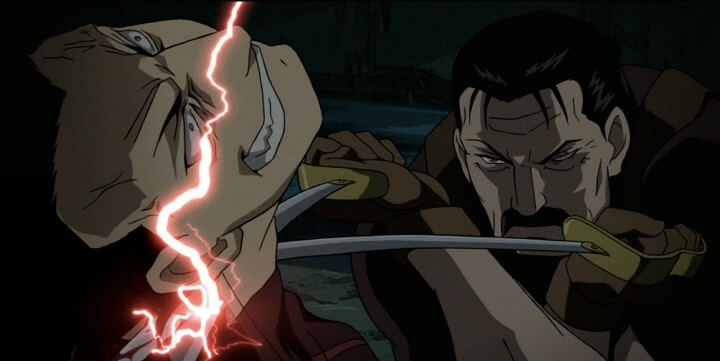 In fact, the series is one full of contrasts — life with death, darkness with humor, friendly faces with evil intentions — and perhaps it’s because of Fullmetal Alchemist: Brotherhood’s sometimes schizophrenic nature, jarring as it is, that show is saved from being too easily held down by just one genre’s conventions, giving it a style that is uniquely its own, even to this day. 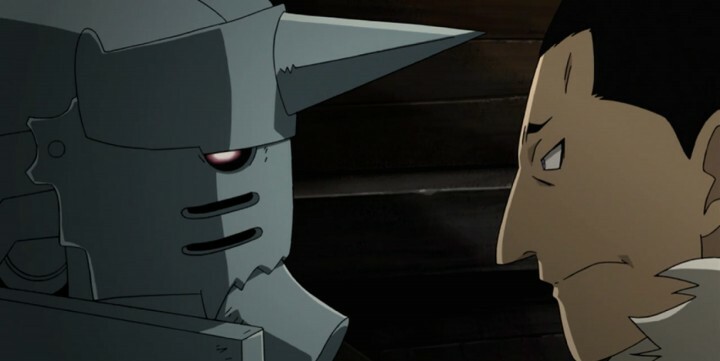 Fullmetal Alchemist: Brotherhood’s first act is a crash course introduction to the series. The first couple of episodes alone cover more content than many series do in their first story arc. From the start of the very first episode we’re thrown right into an active crisis and there’s no time to get your feet wet; all you know is that there’s a freezing alchemist and he needs to be stopped. 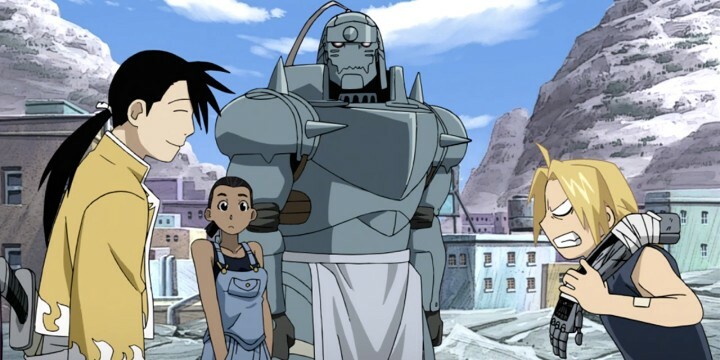 Just as quickly as the audience is introduced to its first threat, we’re introduced to our protagonists, the titular Fullmetal Alchemist, Edward Elric and his younger brother, Alphonse, whose imposing size and metallic armor belie his seemingly child-like voice. The first few episodes provide the audience with constant rewards for their attention. While the introduction begs more and more questions as time goes on, it never becomes overwhelming, as some basic questions are addressed fairly quickly, providing the audience with constant rewards for their attention. As with similarly-paced series, the audience’s intelligence is respected enough so as to never become a clip show of patronizing explanations. However, as the first episode progresses, we’re quickly introduced to Fullmetal Alchemist: Brotherhood’s dueling tones, one dark and brooding, and the other laid back and even humorous at times. Serious moments are almost immediately undercut by comedic relief, often in the form of chibi-like drawings of the characters in the scene. This humor, a trademark of the series as a whole, is almost always abrupt, sometimes even interrupting the monologues of established murderers, as in the case of Isaac McDougal’s surprise at the Fullmetal Alchemist’s identity as the smaller, much less-metallic of the Elric brothers. This abruptness, however, is so intrusive during even the most serious of scenes, that many might find it jarring. Even so, this critique is often unfounded; often, it actually helps the series from devolving into melodramatic monologues. However, in this second act, the humor largely serves to provide some relief to the audience from the lightning-fast dissemination of information that is thrown our way in only the first 10 minutes of the show. Fortunately, the abrupt humor falls away completely during the most serious of scenes, making them all the more impactful when a joke doesn’t come to alleviate the situation. For instance, in the very first episode, Isaac accidentally reveals Al’s secret — he’s not wearing the armor, he actually is the armor — and accuses the brothers of having committed the “ultimate taboo,” all humor leaves the show as abruptly as it entered. No jokes here. Similarly, in the very next episode, when we’re shown the Elric Brothers’ childhood attempt to resurrect their deceased mother, the dark and bloody scene of their failure is laid bare for the audience to take in. Even after seeing this scene many years after my first viewing, seeing a one-legged, bleeding Edward desperately crawling to save his brother’s life doesn’t fail to elicit a chill down my spine. These dark moments, those without any humor, are some of the series best and most memorable. There’s a reason why the episode featuring the “Sewing Life Alchemist,” Shou Tucker, is still a staple in anime culture everywhere; its horror is particularly memorable because it stands out in a series that’s occasionally side-splittingly funny. Other series that utilize a constant stream of shocking images are less effective than Fullmetal Alchemist: Brotherhood because its dark moments are accentuated by the lighter moments; while your eyes can adjust to a pitch-black room, the brighter the light, the darker the shadows it casts. Speaking of shadows, it’s clear from the outset that we, as the audience are not being shown the whole story. While we’re given every reason to believe that the military that the Elric brothers work for are the good guys, it’s clear from the first episode that there’s more going on than meets the eye. The Freezing Alchemist’s last words, warning our protagonists that Führer King Bradley will lead the country of Amestris to ruin can easily be heard as the ravings of a madman. But, the very next scene is downright unsettling. When Führer King Bradley appears to cut down Isaac, the color flushes from the scene — it is literally the darkest scene in the episode — and all that’s left is the demonic, blood-red glow from Isaac’s blood. This silent glimpse into Bradley’s nature is quickly undercut by his seemingly cordial, and sympathetic, family-man appearance he wears throughout these episodes. Further, as we’re shown more and more dark aspects of the miraculous alchemy, like abominations crafted from various animals or failed attempts at playing God with nature itself, it’s clear that there is darker side to everything in this series. A seemingly happy ending for one episode is quickly flipped on its hide by black-clad monstrous beings named after the Seven Deadly Sins — one of which devours human flesh as an embodiment of Gluttony — who are intent on inciting bloody violence for reasons unknown. Finally, as a murderer named Scar enters the scene unexpectedly and begins killing Edward’s fellow State Alchemists, those alchemists sponsored by the government so long as they act as human weapons for the military, it become abundantly clear that many of the good guys are guilty of what amounts to genocide. Scar, a survivor of what’s called the Ishvalan War of Extermination, is a figurative embodiment of the horrors of war as he easily dispatches our protagonists and nearly kills them, save for the timely intervention of dozens of soldiers and two experienced alchemists. His presence as an existential threat is a clear indication of things to come; there’s something rotten in the state of Amestris, and it extends to even our protagonists, desperate to return their disfigured bodies to normal. After their savage beating at the hands of Scar, the Elric Brothers make a trip back home to fix their injured bodies. Along the way, they conveniently bump into Dr. Tim Marcoh, a medical alchemist who we find out was responsible for researching the Philosopher’s Stone, a powerful alchemy amplifier that our protagonists seek in order to get their original bodies back. This convenient run-in leads Ed and Al to try and hunt down Dr. Marcoh’s research notes, but not before a brief stay at their childhood hometown. This brief reprieve from the main events of the story is a welcome break, as it allows to learn more about these young boys’ early lives and the tragedy they’ve experienced. Comedic relief during this time comes in the form of Major Alex Louis Armstrong, a jacked-out, absurdly large man that protects the brothers during this time. His interactions with just about any character is usually hilarious, mostly because his absurd masculinity is contrasted with his boisterous personality. However, as the boys come to learn, the Philosopher’s Stone is hardly the panacea for their problems, as they learn that the manufacturing of a single stone requires multiple human sacrifices, a line that both Ed and Al are not willing to cross, even to return the bodies they’ve lost. It’s during this search for “the truth within the truth” that Ed and Al come across two former death-row inmates in conditions similar to Alphonse’s; they too have had their souls bound to suits of armor. 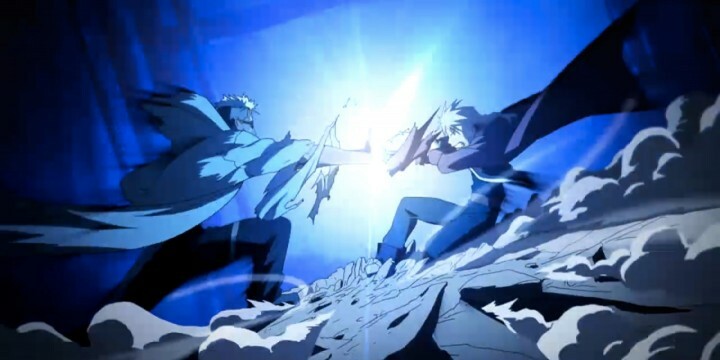 While Ed defeats his opponent, he is soon beaten by two of the mysterious homunculi that we’ve seen undermining the brothers’ efforts from behind the scenes throughout the series. Meanwhile, Alphonse’s opponent, a mass murderer named Barry the Chopper, somehow manages to convince the young boy that he was actually designed and created by his brother and that even his memories were fabrications. Honestly, this plot was a bit forced and felt very artificial. While it’s believable that a young boy like Alphonse would fall for such an obvious ploy, it still falls flat as a conflict because its rectified just as quickly as it becomes a problem. The death of a major character comes out of nowhere and really hits hard. The real conflict of this act comes after Ed and Al’s recovery, during which their military allies begin investigating the military’s higher ups in order to discover why they would sanction research into something like the Philosopher’s Stone to begin with. However, this investigation is cut short by the death of a major character, which comes out of nowhere and really hits hard as the audience sees how a character’s life and death affects everyone they had impacted. Colonel Mustang, the usually stoic fire-snapping alchemist is reduced to tears in one of the most seminal scenes in recent anime history. It’s not an exaggeration to say that this scene is one of the most crucial to the entire series, as it really reinforces the fact that any remnant of innocence can be quickly destroyed and that no one, not even beloved characters, are safe. While numerous subsequent series have utilized this technique of major character deaths to make their audiences “feel” something, I think that many of them have fallen flat when compared to what Fullmetal Alchemist: Brotherhood did years ago. And what really cements the emotional impact of this death is the fact that, in the next episode, Ed, Al, and their childhood friend Winry help a woman give birth. Again, the sharp contrast of death with a new life makes the death’s impact all the more meaningful. The third act of the series is the shortest, in terms of episodes and events, but it’s crucial to the plot nonetheless, even if some of its biggest reveals fall a little flat. When the Elric Brothers reunite with their teacher, Izumi Curtis, we’re shown a flashback sequence in which the brothers trained with Izumi and learned the ways of alchemy before their tragic downfall trying to resurrect their mother. When Alphonse is kidnapped by a group of chimera, humans merged with animals through alchemy, and their leader, a homunculus named Greed, we are finally given some hint of what’s really going on in this series. Greed, essentially, acts as an exposition mechanism by which Ed and Al learn the truth about their long-time assailants from a few episodes prior, thus clueing them onto the fact that something very sinister is at play behind the curtain. As a manufactured human being with regenerative properties and an ability to harden the carbon in his body to super dense levels, Greed is a very imposing foe, but only for a short time. When Ed and Izumi make quick work of Greed and he tries to escape, we’re treated to what is perhaps the greatest revelation of the series thus far, King Bradley’s true identity as the homunculus Wrath. Even so, this twist fell a bit flat for me, as I had been expecting something to be wrong with Bradley from the first moment we were introduced to him; he had always struck me as purposefully two-faced. And while Bradley’s skills are no doubt impressive — and terrifyingly brutal — for a man nearing 60, his true prowess is masked by the fact that we only see him beating Greed, an enemy we saw our protagonists beat only minutes earlier. 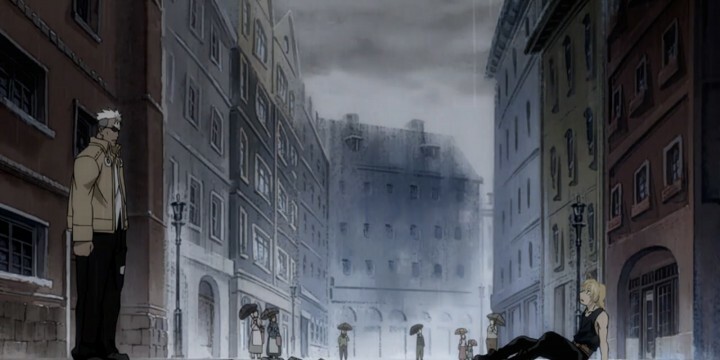 The fourth act of the series opens with an introduction to several new characters from the country to the east of Amestris, the seemingly China-inspired nation of Xing, where alchemy is mostly used for medicinal purposes. One of these newcomers, Mae, quickly teams up with Scar, who is still on his mission to avenge his slaughtered family. The other group of Xing people, Ling and his two bodyguards bump into Ed and Al and quickly come into conflict with one another when the brothers refuse to divulge any information regarding the Philosopher’s Stone, which Ling, a prince of Xing, seeks in order to become the Emperor. These new characters, while coming out of seemingly nowhere at all, fit fairly well into the dynamics of established characters, which is a testament to the writing of the show. One of these conflicts, in which, through a slightly complicated turn of events, Colonel Mustang temporarily plays the bad guy, falls flat. While we know Mustang is desperate for justice for his friend’s murder earlier in the series, we as the audience also know that he wouldn’t immolate a woman just because she was a suspect in that murder investigation. So, the entire several-episode arc of Ed coming into conflict with Mustang, only to later discover that Mustang was innocent, felt underwhelming. The saving grace of this act is Mustang’s ambush plot against the homunculi. 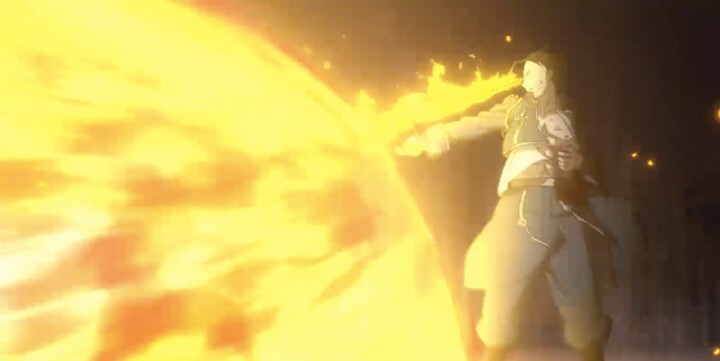 We get to see just how proficient his crew actually is and just how terrifyingly brutal his flame alchemy can be. Lust’s incredibly violent death is a sight to behold and a great victory for our good guys in a series that seems content to set the world against them. The fifth act, easily a high point for the entire series thus far, starts out innocently enough as Ed and Al plot to draw out Scar, which they believe will force the homunculi’s to come “save” the brothers from certain death for reasons unknown. However, this Mustang-style ambush quickly goes awry as Bradley joins the fight. Worse still, Winry stumbles upon the fight between Scar and Ed, thus forcing her to confront her parents’ killer, leaving us with a very emotionally rewarding scene from all fronts as we begin to see Scar’s side of things via flashback sequences. Although the brothers and company are successful in capturing Gluttony for a time, things quickly begin to fall apart. Gluttony accidently “eats” Ed, Ling, and Envy, sending them to an alternate dimension, and Mustang is cornered by Bradley when the latter reveals that the entire Amestris government is in on the conspiracy, forcing Mustang to cooperate as his team is disbanded. Seeing our heroes on the losing end of things really helps the series establish that the good guys aren’t always going to win; actually, they’re probably going to lose more often than not. Although a recap episode of sorts breaks up the proceedings, it doesn’t feel wholly intrusive, as it provides much needed backstory for Hoenheim, the estranged father of Edward and Alphonse. At the very least, it provides some interesting philosophical questions for the audience to chew on, or keep in mind as the series progresses. After returning from Gluttony’s alternate dimension, Edward uncovers the strange revelation that the mastermind of the whole conspiracy, Father, looks exactly like Hoenheim. Although he’s seemingly kind at first when he heals both brothers’ injuries, it’s quickly apparent that this is not altruism; rather, he cares for the boys in the same manner a collector would with his collectibles. Seeing our heroes so completely overwhelmed and beaten, it’s clear that the bad guys are the ones who were really in control the entire time, providing the audience with a special feeling of hopelessness as we wait to see what our protagonists can possibly do next. The beginning of this act begins with our heroes figuratively licking their wounds as they try to come to terms with the short leashes they’ve been granted by Bradley; as long as they don’t make trouble for Father’s plans, their friends and family won’t be harmed. While this period is a nice reprieve from the devastation of the last arc, it leads to some very crucial background information regarding nearly every major character. There’s an incredible animated portrayal of the horrors of war. One episode heavily features the history of the Ishvalan Civil War, primarily from Hawkeye and Mustang’s point of view. It’s truly tragic to see how hopeful both of them were when they joined the military, only to see them fall to becoming glorified butchers. We hear the screams of Mustang’s victims as they burn in massive groups, and we see the faces of Hawkeye’s victims the moment before she pulls the trigger. It’s an incredible animated portrayal of the horrors of war, all encapsulated in 20 minutes, but it helps us to understand why these people are the way they are, and why they’re struggling so desperately to atone for their sins. After Scar, Mae, and a newly rescued Dr. Marcoh make their way North to find Scar’s late brother’s research notes on alchemy, the Elric Brothers and Kimbly, a psychotic alchemist who had previously butchered Scar’s family, try to track down Scar and company. 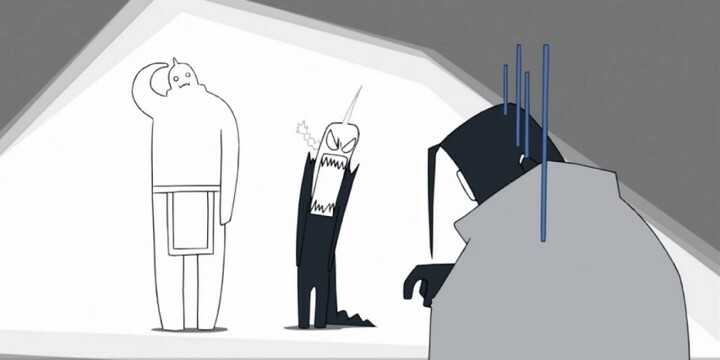 A quick confrontation between Kimbly and Scar quickly reveals to the audience, however, that although Kimbly had been built up as this monster, he really doesn’t amount to much of a threat. It’s really poor planning to give us a new antagonist and hospitalize him soon after his introduction, as it makes it difficult to judge how seriously we should take him. Other than that, we’re left at a bit of a cliff hanger at the end of this act, as the Elric Brothers meet up with Major Armstrong’s older sister, General Armstrong, the commander of the frozen fortress protecting Amestris’ northern border. With this review of Part 1 at its end, I can look back at everything I’ve seen and marvel at almost every aspect of it. First, despite the fact that this was 33 episodes of content, I hardly noticed because everything is so superbly paced; sure, there are some points here and there that over stay their welcome, but they’re hardly anything at all compared to the whole. 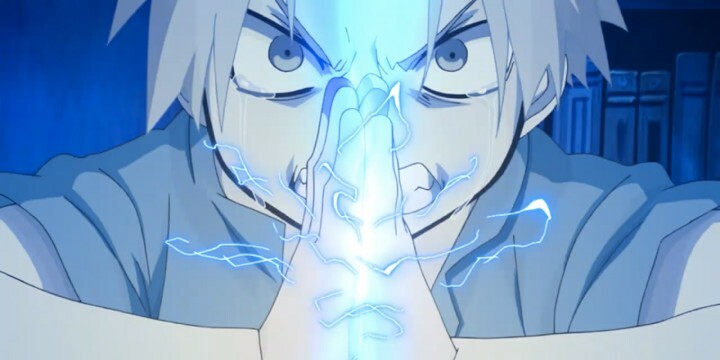 Second, there is still no series that hits emotional high notes quite like Fullmetal Alchemist: Brotherhood. Many have tried to emulate the emotional moments this show delivers regularly and many have simply failed. Perhaps, as previously stated, the reason why these emotional payoffs are so great is because this isn’t just a show of pure shock value, it has real sharp contrasts in tone that make every moment stand out. From one episode to the next you might find yourself choking up, getting tingles down your spine, or just laughing at the antics on screen. Finally, this series is perhaps one of the best written I’ve ever had the pleasure of seeing, minor quibbles aside. Even within this one half of the series, it’s smart without being condescending, philosophical without being boring, funny without being sophomoric, and emotional without being melodramatic; it’s just — in a word — incredible.